Confidently prepare your technician trainees. 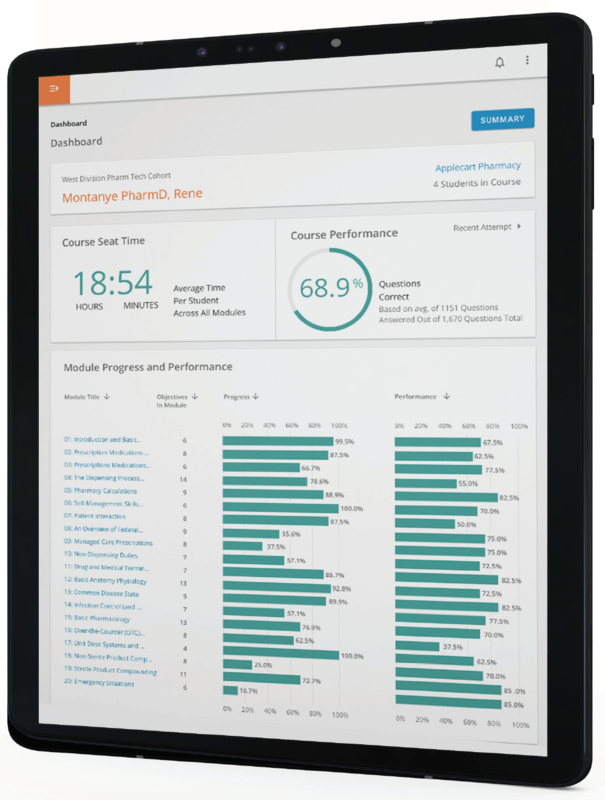 PharmaSeer™ is a digital learning resource built to supplement your existing training or education program. It allows learners to confidently build key technician skills while providing facilitators with clear visibility to learner performance for increased efficiency and confident learner assessment. Launch your technicians’ pharmacy careers with data-driven learning. Self-reporting assessment checks evaluate learners' confidence before each lesson and again at the end of each lesson to help build learners' self-awareness and reliance. Sorting and matching activities help learners to reinforce key concepts of content presented. Flashcards help learners master key concepts and terminology as well as top 200 most-prescribed medications, including brand and generic name, therapeutic class and most common indication(s). Learner and facilitator dashboards make it easy to monitor learner usage, performance and seat time for easy tracking. Talk to an NHA specialist today to learn more about how to get training that prepares your current and future technicians to work at the top of their skillset.